I am a firm believer that to be a writer, one need only to write. The past year, I have written about completely disparate subjects in almost every genre, from relationship advice, to composting tips, great wineries in the Northwest, and both fiction and non-fiction for different clients. I have written about reading academic and literary and casual novels, Ryan Gosling, Jane Austen, Elizabeth Gaskell, Bollywood/ Kollywood movies, and painting on this site. I’ve written a lot of different stuff lately. And you know what? It has been really fun! A picture I took a few years back in the Black Hills, South Dakota. Waiting around for inspiration and writing only when a brilliant idea knocks you over the head will produce little, and will also not give you much practice. That is how I used to write. I was worried that my everyday writing was too mundane, that nobody would ever read it, etc. Although it’s tough for me to admit, my identity as a writer has been tenuously forming for years. That being said, I now write for a few various reasons. I like to read, and I like to create a “finished” product to share with others. I feel compelled to do it, to express myself through words. I enjoy talking, (as anyone who knows me can tell you, I’m sure), and writing is another form of speaking to me. Like I said before, my identity as a writer has been tenuously forming for years, but I have always wanted to write, to “be a writer,” and to produce written works. However, it is only recently that I have felt confident in calling myself a writer. That is because lately, I have really dedicated myself to writing on a regular basis. I took a fiction writing workshop in graduate school, something I’d always been terrified of. Having other readers was empowering. I wrote and edited for a living starting this past summer, (2011). Now I write all the time. I write articles for you all and for an online magazine, for example. It makes me feel amazing, but I was always afraid of writing before. I think I knew that it would make me incandesantly happy. I’m ready for that happiness now in a way I wasn’t before. 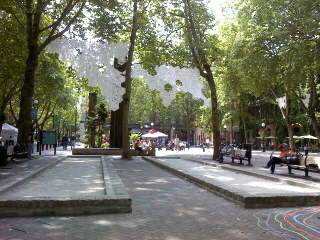 Some installation art I came across one day in Pioneer Square, Seattle. Loved the paper hanging from trees! Reading. I feel there is a strong connection between reading and being a good writer. When I read the words of others, it is inspiring to me. I feel connected with their psyche, with their way of painting the world around them or around their characters. I find reading endlessly fascinating, and it’s what inspired me to write in the first place. Artwork. When I am looking at art, I feel inspired to create. To draw, to paint, and to write. While living in London for a semester and taking primarily art-based classes, I journaled more than I have in my entire life. Looking at pins on Pinterest and pinning to my boards there is also part of this inspiration for me, as silly as it may sound. Love that site! The feeling that comes from finishing or sharing a piece of art or writing with an audience, for example, with you all here. Not going to lie, it feels great to publish, even when the publishing happens on my own blog. Beautiful scenes in nature, like the above photo from Custer State Park in the Black Hills, one of my all time favorite places for inspiration. To move beyond writing for myself in my journal has been really rewarding. Audience matters. Readers matter. Thank you all for reading my posts- I truly appreciate you! As many of you are also writers, I’d love to know- what inspires you to write? This entry was posted in Artwork, Creativity, Fun, Publishing, reading, Writing and tagged Being a writer, Inspiration for Writers, Jane Austen, Pinning pins on Pinterest, Reading, Ryan Gosling, surveys, what do readers do?, what is a genre?, writing. When I write, it is because I feel I have something to say. That is why I relate to your story of only writing when you felt it was interesting. I would love to start just writing every day. I have been asked by some of the authors I interview to stop caring about the audience and to start caring about the writing.. I have a long way to go. I do a lot of writing because my interviews make me….. I have to write something about them even thought the interviews are audio and video in nature. I just always feel compelled to say a bit more. Do things in life that inspire you. Don’t know if you like the show, but good TV and cinema inspire me.As does teaching. And story time with the family. I totally empathize with your initial hesitation to write- what if my words are unworthy? It’s difficult to get over, but totally worth the sense of accomplishment afterwards. Thanks for sharing! Wow Jessie! Thank you for sharing 🙂 I haven’t seen the show, but I will check it out! Thanks for sharing your comment Julie! I sometimes like the incomplete works the best. Thank you for your inspiration. I can express myself through my camera like a piece of me, but I have never been able to “capture the moment” with my words. I started writing my blog two days ago so it would force me to write my feelings. You have is a gift that needs to be used. Keep it up! Wow- thanks for your kind comment! Hope to see you back soon! Thank you for visiting my blog. I decided to return the favor and thought I might weigh in on this subject. Since I primarily do comics, I have chosen the finished product response. I cannot be writing because of the art, as the 2 are married as one. Neither do i write for my audience. If I like what I’m doing, chances are someone else will. Reading does play a part, because we are all inspired by what we have read. I read “Classics Illustrated” as a boy. In junior high I wrote a story that received an “F”. The teacher told me it was too good, and I must have copied it. I told him I had not, and he changed it to an “A”, and said I would be a professional writer someday. Years later, while adapting the story to Comic format, I realized i had subconsciously “borrowed” 2 literary devices. One was from “The Count of Monte Christo”, the other from “Around The World In 80 Days”. The excellent book “Drawing On The Right Side Of The Brain” details how, when we draw from our imagination, we are in fact producing versions of things we have observed. The same can also be true in writing. For this reason I try not let things i have read be my primary influence either. I most enjoy dissecting my work after it is finished. This is when i discover a lot of things about myself that are subconsciously occurring in the creative process. Thank you for your insights. I really love how you put them too, and it was really interesting to read about the “Drawing on the Right side of the Brain” points too.